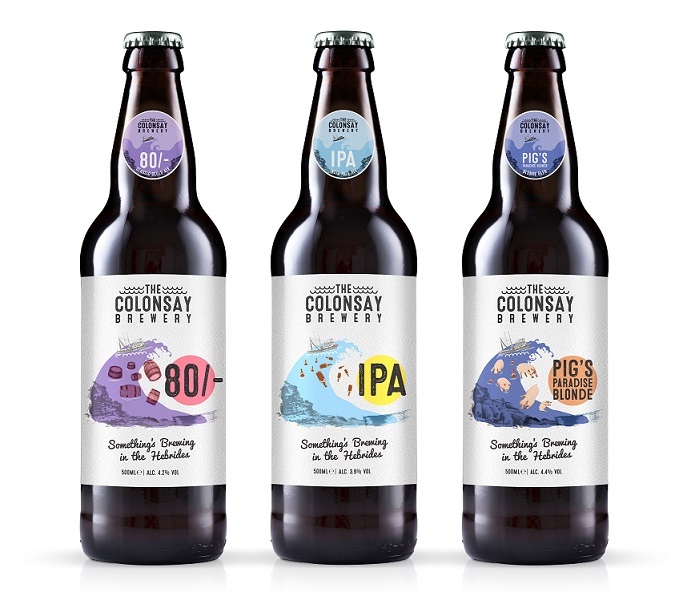 Colonsay Brewery is undergoing a major investment programme with a complete redesign of its packaging and new UK wide distribution deals in place. Colonsay Lager will also be disappearing from the shelves shortly and is being replaced with Pig’s Paradise Blonde – the same refreshing recipe but a completely new look bottle. Brewery director David Johnston said: “The original labeling, featuring one of Jean McAllister’s Kiloran collages has served us well but we felt we needed a fresher image. The brewery was started in 2007 and has grown steadily ever since. From later this month (July) Colonsay beers will be available to outlets throughout the UK, with two new distribution deals in place. Brewer/director Chris Nisbet said they expected changing the name of the lager should be a major boost to sales. “We worked out rather late in the day that craft beer drinkers don’t drink lager and lager drinkers don’t drink craft beer. “We have had to work hard to overcome this but are confident Pig’s Paradise Blonde will encourage all to give it a go. Chris revealed that production of beer on Colonsay has been steadily increasing this year with tanks being transported to Alloa for bottling. “Like everyone else in business on the islands freight charges are a massive barrier to progress for us and we have to look at ways of reducing our costs as much as possible if we are to succeed further in the highly competitive beer market,” said Chris. A new range of clothing and glassware will shortly be available from the brewery shop.